Recently I just read the book Is Shame necessary? by Jennifer Jacquet. I was a bit in two minds about it because I’ve read Brene Brown talking about how awful it is to be shamed, so I thought the answer was ‘of course not’. Turns out the answer is actually ‘Yes, as long as you do it right, also climate change might be a bit a problem’. Jacquet contrasts shame and guilt, Shame is what is imposed on you from the outside, guilt is what you impose on yourself from the inside. But then she points out: if we want people to change their social norms, their idea of what is right and wrong, then guilt, by definition can never do that. It can only maintain social norms that already exist. Then we switch to discussing a case study of some change we need to bring about: fixing climate change. Here Jacquet points out that given the huge negative externalities of climate change, a few people making an effort in their own homes, can never fix the problem. If the motivated 10% go out and buy electric cars, ok that could help if that promoted development of electric cars and green electricity till they become cheaper and better than petrol cars and petrol, but not otherwise. If people decide to buy dolphin friendly tuna, that doesn’t actually stop a lot of people not caring and still killing dolphins. Plus they could over fish the tuna leaving nothing for the rest of us. Further Jacquet points out that when ‘big-tuna’ said, ‘fix the problem by voting with your wallet’ they took away our power to fix the problem by voting with our votes. This message strips us of our citizenship and reduces us to mere market players. The market wants us to leave things up to it, but really, why should we if we don’t want to? Why can’t we, as citizens, decide how we are going to fish and what values should be upheld (‘dolphins are great’). Are we a market economy (using markets as a tool) or a market society (where market values seep into every aspect of human endeavour). Obviously we are the second one but I’d like us to be the first one. (Sandell also discusses this very well). She then points to some examples of bad shaming and says, isn’t it more the norms people are being held to is wrong, rather the, necessarily, the method used to uphold those norms? I was pretty much convinced by this. The people doing the shaming should actually be the victims of the behaviour they are shaming. So if the behaviour only hurts you (food delivered late), don’t try to shame them by telling all your friends, let that one go and focus on the behaviours that hurts you and all your friends (air pollution). Only bring the big guns (shame) when there is a lot of work to do. I.e. use shame when there is a big obvious gap between what we people should do and what we expect from them, not just a bit of a short fall. I actually have a personal anecdote about this one. Back in the day of e-mail petitions that got sent round from your friends, I was asked to write to the police about a women who had murdered her two children, to demand something. ‘You know what?’ I thought, ‘the police have got this’. The person has been apprehended, she’s under arrest, we have courts and laws and judges that know what to do. This is in hand. I didn’t need to shame that women, or the police. But many times there are no laws that will step in. The banks didn’t break the law when they crashed our economy, or when they poured money into the housing market and drove up house prices in an arms race. There was no law that said they couldn’t spend their bailouts on bonuses… shame was the only tool we have. The shamee has to care what the shamer thinks. If the person you try to shame, doesn’t care what you think, you are stuck. So it’s best of people are shamed by their own community, for example a black newspaper calling out non-voters who were mostly black, or Greenpeace targeting seafood practices of Trader Joes fish suppliers because their customers were more likely to care what Greenpeace thought (apparently I don’t know much about social class in US supermarkets). However, then do also give the person being shamed a chance to reintegrate. If someone was bottom of Greenpeace’s list, they can also move to the top and then boast that they hit number 1 on the list. So revolving doors really cut down on who can shame. If a TV station airs a piece critical of the Koch brothers (billionairs most people haven’t heard of) but a Koch is on the TV station board and a TV exec shows them the piece before it is aired and allows them to comment… not very credible. And apparently Russian CEOs would only resign or change if British or US paper shamed them, not a Russian one. There might be a virtuous circle to this. People might seem trustworthy because they shame people. We don’t have time to sign a million petitions. We need to target shaming to the most important behaviour. Ideally someone could draw up a list. For example, we’ve wasted a lot of time worrying about boiling kettles with just the right amount of water in, but apparently (I’ve lost the reference) this only saves as much energy as not driving for a few seconds. Total waste of time to worry about that. Find the pivot point and hit that with shame. For shark fin soup with many suppliers (fishermen) maybe hit demand (restaurants). For rainforest clearance, when the companies doing it don’t care, hit the nine banks profiting, for companies in a pension fund, target those ones in which the pension fund held over $2million in stock. For tax avoiders hit the people who owe most. How can you get the most bang for your buck? But also make sure you’re not being evil. There’s an example of how a possible drunk driving shaming method claims it works, but is also quite soul destroying, with no respect for human dignity. This is drawn out in the next chapter on internet shaming that suggests a) corporations are better targets than people as they are not people and don’t have human dignity and b) they are probably far more powerful and a far more useful target for change. So all very interesting. Shaming is a useful tool which partly rests on a discussion each society has, as to what is public vs private data, and, because it requires an audience, shaming will always be a moving target as people change what we care about. Also we should probably do something about climate change. Since reading a bit about diet and nutrition and fasting, I thought it would be fun to try a proper fast myself. Firstly I think it’s probably a pretty useful treatment for type II diabetes and I wanted to see what it was like to see if it’s something I could recommend. Then, Tim Ferris’s podcast was quoting Seneca (I think), saying the way to not fear being poor, was to live as a poor person for a week, eating simple food and wearing plain clothes, so (summarising) that makes fasting a philosophical exercise. And Herman Hesse’s Siddhartha also described the importance of being able to fast so that, not needing to be busy chasing after food, you can sit back and let opportunities come to you. I haven’t read the novel, but I came across that passage somewhere. So I wanted to try fasting too. I started small. I did a few one day fasts on Sundays in the first half of 2017. I was thinking about it quite a bit but I got started almost accidentally, I decided to not eat till 12, I ended up going for a walk in the park at that time so I missed out on eating lunch, and while walking I felt so well and energetic, that I just carried on for the rest of the day. As background, I should point out that I don’t have any health issues myself, I’m not diabetic and I’d been eating low-carb high-fat for four years at that point. I.e. 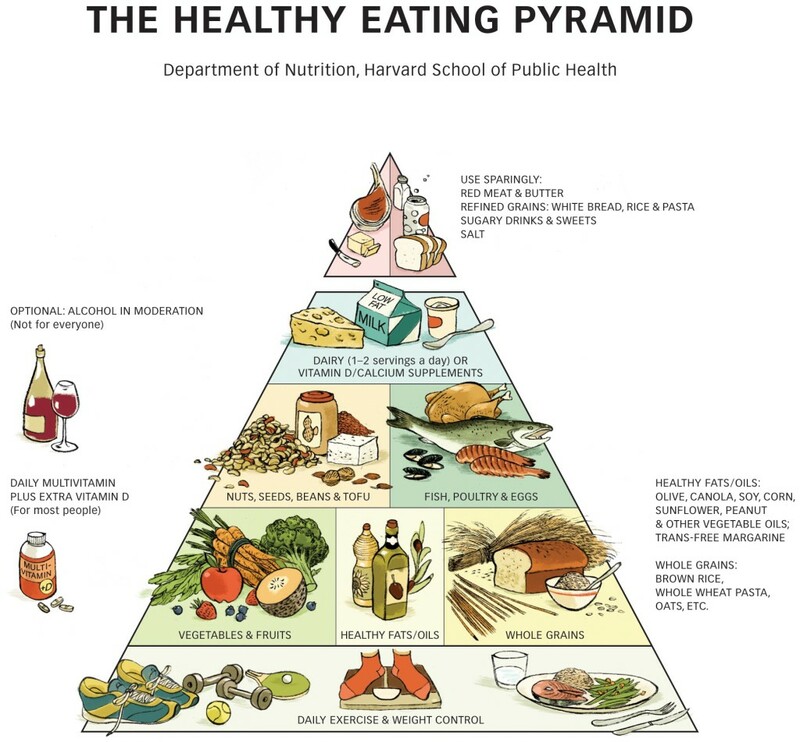 replacing bread, potatoes, rice and pasta with vegetables, eating the full fat version of food, but then sticking to this only around 85% of the time. So I’m probably more adjusted to burning fat than the average person. After that start I carried on with one day fasts on Sundays and these were reasonably easy, though I did have a tendency in the evenings to remember that the local shop which is open till late and I had to remind myself that I wasn’t not eating because I forgot to buy food, I was not eating deliberately. Then in August 2017 I tried a five day fast. I didn’t know what the effect would be and I was afraid I might faint at work, so I waited till I had time off. I initially intended to do three days, but the book on fasting I bought said the first three days were the hardest and there was no point stopping there and in their clinic they only recommended 7 or 14 day fasts, so I carried on! My stop time was defined as the day before work as I had no clue how my body would respond to eating again. The book was Jason Fung and Jimmy Moore’s The Complete Guide to Fasting. So I ate nothing whatsoever for three days, but drank plenty of water and had my normal amount of black coffee, i.e. one or two cups a day. On the fourth and fifth days I also included bone broth. I boiled up two or three bones for hours on end and added veg to the mix. However, I was very careful to filter out any solid food, more for the principle of the thing, as there is plenty of fat in bone marrow, so I was getting some calories there, as well as, I assume, plenty of minerals. These weren’t marrow bones though (i.e. the bones were narrower) so there was less fat. I can’t work out if my five day fast was easy or hard. In some ways it was easy, I wasn’t too hungry, I could happily watch other people eat (I only tried it twice), I wasn’t cold, I didn’t feel the slightest bit faint, I felt pretty well. In some ways it was hard, I felt slightly under the weather, if you imagine a mild cold I’d say I felt half as bad as that. Without feeling hungry as such, I spent the evening of the fourth and fifth days imagining how much I would eat on the sixth day, though in the morning of the sixth day I felt fine and didn’t eat till an hour after waking up. Of course I saved a bit of time and money on eating. I actually found the first thee days easier than the second two days though. By the fourth day I was getting pretty peckish and as my fasting book recommended bone broth I did make and eat that. I did eat the broth with quite an intense concentration, which was funny to ‘watch’. When I started eating again I didn’t do anything complicated. I started with a small version of my normal breakfast. Normally I have two eggs fried in a lot of butter and this time I had one egg fried with very little butter (I have a vague impression fat is bad for delicate stomachs). I felt really fine and normal and two hours later I had a normal breakfast, i.e. two more eggs fried in butter. Later in the morning when I was out and I promised myself that if I wanted a croissant I could have one, then I totally forgot to buy one! After that I ate normal meals in what felt like a normal quantity, but again, I did have that strong concentration while I was eating on the first day and felt totally uninterested in the salad. I think my body thought salad leaves were a pointless waste of time with too few calories to be worth eating. After that I carried on as normal. No problems. Having done something as huge as a five day fast I didn’t feel that I needed to do any one day fasts anymore and I stopped doing those. However, if there is any health/medical benefit to fasts, and I do assume there may be, I wouldn’t assume that one five day fast a year is better than weekly one day fasts. We probably need more research and it would also depend on what you want to achieve. However, in terms of a personal challenge, I definitely feel that an annual five day fast gets me off the hook for a weekly one day fast. So annual… ? Yes in 2018 it was time for next fast. This time I made it a seven day fast in July. As I had been so well in 2017 and didn’t faint at all, I fasted while working as normal (I only have an office job). In fact I highly recommend being in work as it filled up my day, kept me distracted and busy and this seemed to made things much easier. I started on a Sunday and though I did feel a bit tearful in the evening about my laptop, I really think it was nothing to do with food and was just about how annoying my laptop is. Again I had as much water as liked (mostly fizzy water) and the normal amount of black coffee (two americanos a day). This time I didn’t have any bone broth. I do think fasting was easier this time and that my body is getting into practice. I also thought of it as a physical challenge, like running a marathon. Every time I felt a bit miserable, or fed up (especially on the Wednesday afternoon, day four, while working from home), I thought: ‘would I rather do a two mile run?’ No I would not. Obviously I appreciate that training for a marathon takes more than two mile runs, but even a two mile run seems harder and more unpleasant than fasting. That means this is a physical challenge I can do while sitting on the sofa! Best challenge ever. I preferred to spend the fast quietly at home in the evenings, as it seemed like a good combination with a bit of a retreat from the world. Plus I didn’t want to join friends in restaurants, though I was happy with the idea of soda water in the pub. However, on the Tuesday (day three) I did join a friend for a three hour walking tour of central London, so I don’t think I was low on energy. Again I felt well, and normal, no faintness, no coldness (it was the middle of a heatwave), no problems with concentration at work or at home. I felt a bit ‘faint hearted’ like faint headed, but around my heart, for a short time in the shower one morning, but that was pretty much it for physical symptoms. I kept a careful eye on my weight. If I had dropped below 60kg, I would have considered stopping the fast. As it is I didn’t even get to the bottom half of the healthy weight range for my height. 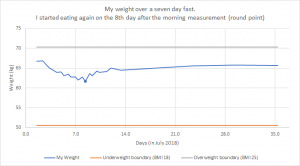 Though I lost quite a bit of weight, it was evidently mostly water, as it snapped back on again once I started eating again (though I kept hydrated and drank plenty). It’s quite interesting to see my weight return right back to the original amount (or a hair lower) without me paying any attention to the amount I was eating. I have to say I really enjoyed my first meal. 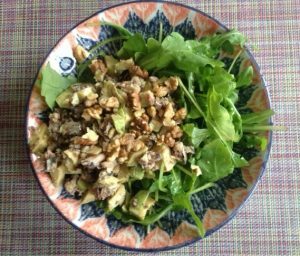 I had a whole avocado mixed up with a tin of sardines on a bed of rocket with olive oil, salt and pepper and a few walnuts (I’d say that was about double or 1.5x a normal quantity). When I sat back with my full tummy I felt so happy. Like imagine if you’d given up coffee and chocolate and TV as a challenge, and then after you were done, you sat in front of your favourite programme with a coffee in one hand and chocolate in the other… that’s how happy I was. I think this is literally due to serotinin production by my gut, if this is the case, that’s pretty fast work. The thing is though that neither coffee, nor chocolate nor TV are essential. I actually took this to mean that as much as I enjoyed eating again, I had a lot more than seven days worth of food stored on me. We’ll see what a fast is like in 2019! I also need to make more of an effort to do exercise on the first day, like a two hour walk, to get me into ketosis quicker. And in the past, on two occasions, it really is the combination of not eating and exercise that has made me feel really well, even euphoric. So in summary, I’d definitely recommend fasting as an exercise in philosophy or as a physical challenge to see what your body is capable of. If anyone is interested in fasting, but worried it might be unsafe, I’d say, start small. Start with just fasting till noon, then go up to one day at a time and learn about it as you go. Remember, when you feel hungry, it’s not a straight line up. You won’t feel more and more hungry. Its more like a curve that goes back down again. So if you can wait that out, you will feel comfortable again. But if not, just eat, and learn more and try again later. After all we were born in the crucible of evolution, our bodies can do a lot more than we think. So after my laptop was stolen, I was in the market for a new laptop. Should I get a second hand one? (painful as I had just lost one! Probably someone else is buying my second hand laptop as we speak). Should I even get a desktop? But I do like reading webcomics working on the sofa, or on the train, or anywhere, so a laptop it was. Should I get a Mac or a PC? Unfortunately, I have completely bought in to all that stupid advertising that makes Apples seem cool and better, and they are pretty glossy. Plus, I always wanted a Macbook Air and that is now the basic version. But I don’t feel Apple has any good options. I paid £1000 for a PowerBook four years ago, but now they cost £1200 because they are the better version while the Macbook air is the basic version, but because that’s solid state memory, I have to pay extra just to have the same amount of memory (which to be fair is plenty, and nobody even quotes the memory anymore, but I grew up in an era when more memory was cool. When my first laptop had 40GB storage, that was a big deal and my friends were impressed [one friend]. It’s quite funny to root around in my brain and see where this idea, that more memory is cool, comes from). At least the Mac book Air has a few ports, but the Powerbook only has the new USB3 ports. I’d say power, headphones, two USB-normal ports and one thingy to plug in a screen or projector (HDMI or VGA) is the minimum a laptop should have. Apple computers do not provide this, so I’d have to spend money on adaptor cables (And then I’d have to store, them! It’s just more stuff to keep track of, they wouldn’t bring me any joy. Marie Kondo should give Apple a good talking to). Meantime my basic work PC laptop has got millions of ports. And no laptop has a DVD player anymore, which is quite annoying. I really had thought laptops were supposed to be getting better and cheaper, but I don’t get to even pick one. They are just getting more expensive and have less stuff. When are the economies of a mature technology going to kick in? So having had PC’s at work all my (working) life and as I prefer Microsoft excel on a PC I did look into buying a PC, but I already had the Mac version of Microsoft Office software paid for (the thieves didn’t take the piece of paper the the licence was printed on so that was still mine). Meantime it currently costs £120 for a PC, so as the nicer laptops were not that far below the MacBook Air, I thought I could stretch to an Airbook (anybody who thinks I am wasting my money on a pointless glossy status symbol is right. Macs are so nice and glossy). So, standing in the shop, just before I bought my nice shiny MacBook Air that I always wanted, I had one last question. Of course, the most widespread software in the world, Microsoft Office, that I only bought four years ago, is still supported isn’t it? No. No it is not. New Microsoft Office software is £240. More than double what I paid in 2014, when it was £108. Apple is dead to me. I mean maybe this is not all Apple’s fault and it’s equally Microsoft’s fault. They’re dead to me too. Damn their rent seeking monopoly based business models. So is there any way to opt out? Obviously, I’ve heard of linux, but I’m not an expert, I don’t want to spend time and effort and make my laptop my hobby, I just want a box, small enough to travel, with a big enough screen to work on, with a browser, and email and file storage (so I can scan all my papers and chuck them as they don’t bring any joy). Also some degree of a glossy status symbol! (It’s ridiculous, but there it is). So I googled linux laptops (there are only a few out there). I.e. a laptop that works out of the box, no more different from an Apple/PC than they are from each other, and landed on Purism. The 13″ one is the same price as a PowerBook, or a MacBookAir plus Microsoft Office. The big, big, BIG selling point is that they will not spy on you and all their software is open source and verifiable by third parties. I remember how betrayed I felt when I realised that the Mac address book tool, that I’ve been filling in with data on my friends since I bought my very first laptop, is now imported onto your phone and freely available for any app to help themselves to. And you can’t export it to an excel spreadsheet (I did export some sort of wall of text version) and you can’t even delete people on your phone wholesale, you have to delete each person one by one! It was exhaustingly tedious. Purism talk about how they are making their computers as secure as humanly possible and they won’t spy on you ever. And they can’t sell your data as they don’t collect it in the first place. Not having all my data sold to companies who want to use it to exploit me, is quite a nice feature in a laptop. As a tiny company producing laptops for the same price as Apple one of the biggest manufacturers in the world, that really seems like they might break open Apple’s stupid monopoly (which this blog should show: that monopoly is partly powered by my own brain). Purism looks pretty good, I haven’t researched their claims properly, just the bits where they say it’s a laptop that works, and it isn’t a Mac or a PC, and it has a free version of Office. 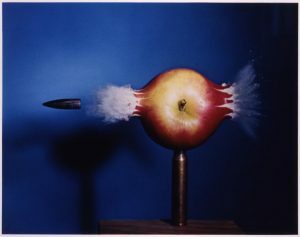 I never wanted to learn to use the apple equivalents, but I’m willing to put the effort in for a good cause this time. So speaking of status symbols, that whole ‘being part of a movement’ idea is good enough for me. I’m assuming the actual laptop won’t be quite as smoothly glossy as a Mac, it does look fairly glossy, and I’m pretty sure the power cable will be hideous, but I’m part of a movement, and the computer won’t spy on me. And it won’t default to google which definitely does spy on me. Plus all the free software sounds good, there seems to be a free version of photoshop which is certainly better than the nothing I have now, (I used to have photoshop at work so I did miss not having any useful image manipulating tools). I have to say, this is a bit of a leap of faith. I don’t think their online order form really speaks to the non-expert buyer (me) who has no clue which sort of memory to buy: M.2 SSD vs 2.5” SATA 3SSD (I looked it up, but I’ve forgotten. If you don’t know the difference, it means you’ll be fine with the default one, but they should still define their acronyms). It’s not heavy-handed symbolism. It’s Art. So see my next post on how to order from the US to the UK, what fees and charges you need to pay, how do you pay VAT at customs, after I’ve gone through it and figured it out. Then we’ll find out if the normal, non-expert computer user (me) can use a Linux laptop. Author Christine DelonPosted on 10 April 2018 9 April 2018 Categories UncategorizedLeave a comment on Getting a linux laptop as a non-computer expert. What if you’re really sick of Apple and Microsoft? New Year, new energy, I do like the start of the year (there just might be a link to all the time off I had at Christmas and New years). I was thinking about some ideas for changes you could make if you were thinking of New Years resolutions. And if you think the new year is an arbitrary time of year then, good news! you can also read this blog post at any other time. Having decided the ‘rules’ you want to live by: think how mindfully achieving your aims and having a sense of agency is better than, say, the monkey brain enjoyment of a cheap supermarket cake that doesn’t even taste that good. Enjoy mindfully planned exceptions. It’s not about never having treats. Plan your exceptions by imagining you are in the future looking back and decide if you think it would make you more or less happy to indulge. Then later actually look back and decide if you were right or not and what you will choose to do if the same choice comes up in the future. Be fair on yourself. If you skip lunch and get hungry you will crave snacks and chocolate before you become consciously ‘hungry’ (I certainly do, I get a good 30-60 min phase of thinking about chocolate before I ever feel consciously hungry). If you find yourself eating junk food, think whether the junk food is the problem or if the previous meal was the problem. Look out for yourself. If you were looking after a five year old child you wouldn’t be too busy to get them a proper lunch and you’d get them home in time for a proper supper. Swap to full fat milk, yogurt, etc. The fat will increase satiety in good proportion to the amount of extra calories, leading to more fullness and less need to snack. Swap starchy foods for half the amount of fat. Halve your rice and put a quarter the amount of butter or olive oil on top. The same calories but more delicious and you’ll feel fuller. Highly processed starchy foods, like bread and cereals, crisps and popcorn and rice, will spike your blood sugar up and the resulting drop will make you feel hungry. Half the amount of fat will have the same calories, will keep you nice and full and will keep your blood sugar on a comfortable, controlled, even keel. Alternate every glass of wine with water.If you are out a party and if you like drinking all the time, instead of trying to drink less, substitute what you drink. My favourite is apple-shorle. A little apple juice with sparkling water. The nudge unit (in David Halperns book) has advised for ecigs purely on the basis that a substitution is so much easier than quitting (and ecigs really are so much safer than cigarettes, though that is the lowest bar ever). Substitute fizzy drinks with sparkling water with a dash of lemon and/or lime, or even just plain sparkling water. Obviously if I have a choice of sparkling water or coke, my monkey brain will prefer the coke. But you could reframe it as nothing vs a drink. Sparkling water is much more fun than nothing. Consider drinking your coffee black, then it’s zero calories, but apparently it still has soluble fibre. Practically good for you, or actually good for you, who knows. Who cares! Coffee is delicious. Substitute breakfast cereal with fried eggs, or boiled eggs if time is tight. 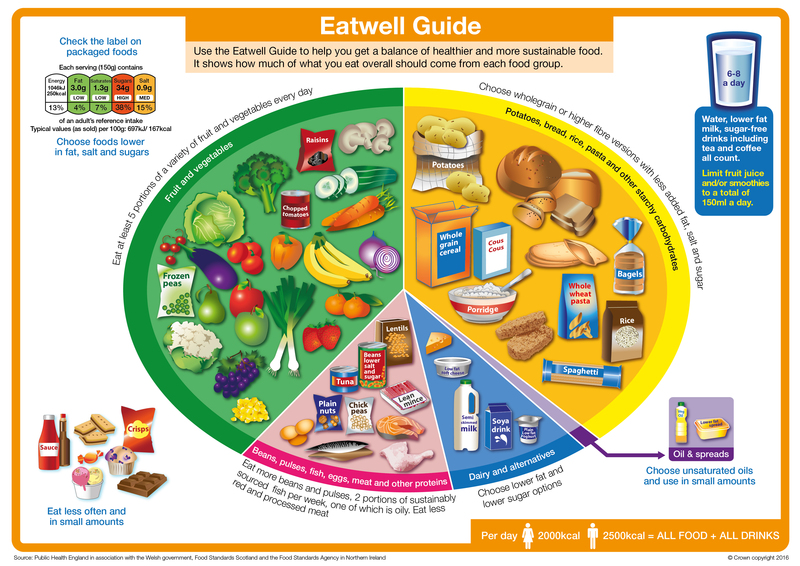 Again this gets you away from the highly processed, empty calories in the processed wheat/maize (which is what every single cereal is apart from oats, and swaps in a vitamin rich food with the full range of essential fatty acids and essential amino acids). In case you didn’t get the memo, we’re not worried about dietary cholesterol anymore (I wish there was an actual memo, or people admitting that the old advice was wrong and presenting the reasons for the old advice and the reasons for the new advice. Let me know if you know find that). Only eat cakes/chocolate when out with friends, never snack alone. Quit all snacks. Eat three meals a day and that’s it. Saves time and thought. If you can’t go between meals without feeling hungry you are doing your meals wrong. Mindfully discuss a desired habit change with a friend. Figure out the problem (for example: I have lunch at 12, I work till 7, when I get hungry and there is only vending machine food available and I don’t want to spend time and energy on bringing cooked food in, also I only sometimes get hungry so I can’t bring in perishable food, as it would get wasted). Discuss a range of solutions, when the first three ideas aren’t a good fit keep discussing ideas. One day go to the supermarket before supper. The next day eat a really good supper then go to the supermarket. Watch yourself glide paste those donuts on sale, with no difficulty. Everyone always said you shouldn’t shop on an empty stomach but when I did this experiment, pretty much by chance, I was really surprised at how strong an effect it was. Only enjoy sweet foods and drinks as a dessert on a full stomach. Sugary drinks, including orange juice and fruit smoothies, will give you a massive sugar spike. Avoid the spike by only eating sweets on a full stomach. Instead of boiling up pasta, what about boiling some frozen green beans to have with your sauce. 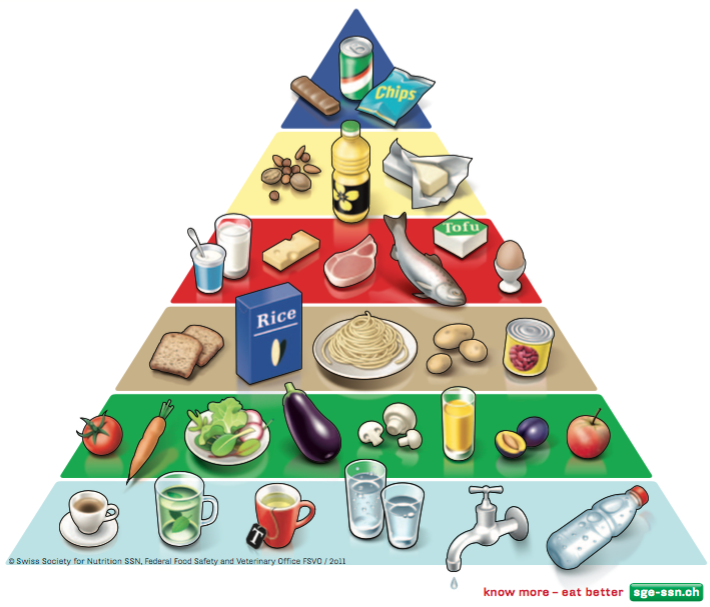 The Swiss food pyramid caps starchy carbs at 3x 30-50g a day (p19). That’s three small slices of bread or three very small helpings of pasta per day. Replace white, nutritionally empty carbs with green vegetables (still 80% carbs which are slow release with some plant protein (not nutritionally complete without complicated mixing and matching, but still useful) and the water-soluble vitamins). There we go: a few ideas for changing habits and some ideas for what habits you could change. Hope some of them are useful and spark some further ideas of your own. Have a happy year. I was at a Gresham Lecture yesterday, To Die or not to Die (whether ’tis nobler in the mind to suffer the slung arrows of outrageous fortune, or to take arms against a sea of troubles…). The speaker was Sir Allan Ward a judge with a 60 year career behind him who is now retired with time to give interesting talks. He started by saying how awful the death penalty is and described two of the prisoners he had met in South Africa who had completely crumpled and been destroyed just by the sentence, even before the actual execution. This was moving, but also, in the UK, safely dated, we have gotten rid of the death penalty now because we all agree it’s bad. This was the jumping off point though, he had thought he would never have to deal with life and death issues again, but they do still exist. The first story was about a 16 year old Jehova’s witness, who, with his parents, didn’t want a life saving blood transfusion as part of his treatment for leukaemia. The doctors did want him to have the life saving blood transfusion so the case came to court. In some ways it seems like a no-brainer to say of course the child should be ‘forced’ to have the blood transfusion, However, Sir Allan went to visit the boy in hospital, made sure the 16 year old understood the risks and issues, and discussed and listened for some hours. He also wanted to make sure that if he judged that the child should have the treatment, the boy would accept the judgement and not try ripping the tubes out. Indeed he argued that because the decision had come to him, the judge, this was the heavenly equivalent of a sick note that he could hand over to St Peter at the pearly gates to excuse his sin (I’ve deliberately left the quote marks off there). So when he left the hospital and wrote up the brief on Friday night, the appeals court were all ready and set for the appeal. But there wasn’t one. The family’s solicitor, himself a Jehovah’s Witness, said they had planned to appeal because they had thought their opinion would be dismissed, but when their views and values were taken seriously and listened to, even if ultimately the judge didn’t agree, they were satisfied. However, there was a sober epilogue. The leukaemia returned 10 years later, and as an adult he refused a transfusion and did die. So the judgement gave him a decade, but ultimately didn’t save him. It seems to me that the boy might have felt that an external court could override him as a child, but as an adult man, his path was clearly to stick with the tenets of his religion. The second story was the longest and concerned conjoined twins. The parents came from a small village in Malta which has an agreement with the NHS that their complex cases can come here for treatment. You probably heard about it at the time, the twins were Jodie and Mary (not their real names). The twins were joined up around their tummies with their legs sort of stuck out at the sides and grown all wrong, it did look quite bad. Indeed, very understandably, it took the mother days to be able to be in the same room with them and to touch them. Jodie was well but Mary was brain damaged. Jodie’s heart was beating for Mary which doctors suggested was equivalent to her little baby heart pumping blood round a 10 foot tall person. The doctors thought they could save Jodie and carry out complex surgery to give her a healthy normal body. Mary would have to die. I did think this moral dilemma was somewhat reduced by the possibility that Jodies heart could fail under the double strain and they could both die. It seems then it’s choice of saving one instead of none. However, in this or another case it might be that Jodies heart would grow strong and they could both live, though with a limited quality of life and being bed bound. So the parents thought they should wait things out and if the babies died that was God’s will, while the doctors were sure they could save Jodie. A very cynical person might wonder if some parents might prefer a dead child to a severely handicapped child and might wonder if this influenced the parent’s feeling that Mary should not be sacrificed (though the doctors were confident Jodie would be healthy, the parents were not so sure). So it came to court. Three days in Sir Allan raised a further point: if the doctors take up a scalpel to separate the twins and save Jody, but knowingly kill Mary, is that murder? This could have been argued very differently a century ago. Murder involves killing a ‘rational human’ i.e. I guess killing animals is ok. So was Mary a rational human? Her brain damage would, a century ago, have disqualified her as a ‘monstrous birth’. Perhaps it might then have been perfectly ok to let her go quietly, and maybe even to help her along. Nowadays it was quickly agreed that Mary’s brain damage didn’t apply and she definitely counted as a rational human. So having described this much, I’d like to stop discussing the actual case, take a step back, and say, I think it’s quite right for the state, for the taxpayer, indirectly for us, to take this time and effort and money to discuss these cases and go into the issues. For example, far better to get into the issues of whether the operation is murder or not before hand, so you can figure it out without any doctor having to sit in the dock and wonder if he will wind up in prison (in the end they decided that because Mary was such a drain on Jodie, and could kill her, it was ‘self defence’ for Jody to be separated and the doctors were acting as a proxy for Jody’s self defence). And after all, if the taxpayer spends a fortune in wages, you do get 20-40% of that right back. Michael Sandal argued at the end of one of his books on ethics, that when you have a knotty, thorny ethical dilemma, perhaps the exact decision you reach is not the most important thing. The whole point of a difficult choice is that there are arguments either way and that perhaps the most important thing is to honour the difficulty with thought, attention, time and effort. You must think carefully every which way, but ultimately there might not be a clearly right or wrong answer. He illustrated this with two men who each had brother who had committed murder and might do so again. Ultimately one man dobbed his brother in, while the other refused to do so. In the end you could agree with both men. However, Sir Allan argued this was not exactly the case for Jody and Mary. The question was not what was moral, the question was, what was legal. And he raised this again in a question at the end. Currently assisting suicide is illegal so if someone brings their wife to a Dignitas clinic in Switzerland, this is illegal, even if we all agree the law needs to be changed (and clearly we don’t all agree otherwise we would change it). I did wonder about all the cases we never hear about because the parents and doctors agree. If the doctors had just gone ahead without any court cases, would they maybe have been up for possible murder (even if Mary’s death turned out to be indirect self defence) or would nobody have thought to raise the issue? The difference between law and morals also comes out very well in this paper: No Child Left Alone, about mothers and father who leave their children alone. Surprisingly, it is actually readable, even though it’s science! But don’t worry, no children where harmed in the making of this science. The children were only left alone in scenarios that were read and graded by amazon Mechanical Turk (what a brilliant way to get research subjects). The authors, Ashley Thomas et al., conclude that in the US today there is a new moral code and it’s totally immoral to take your eyes off your child for even five minutes, even when the risk of kidnapping/murder is around 0.0007% or 1/1.4 million a year (fairly low) and that when police were called out to bring two lone children home, the kids were more at risk being driven in the car than they had been walking home alone (with the permission of their parents). This even comes up in Patrick Ness’s new novel More Than This. Two brothers are left home alone for a short time, in those few minutes an escaped prisoner pops by and something terrible happens to the younger brother. The parents then spend the next 10 years blaming the older brother, who was eight at the time. The older brother discusses it twice, and both friends are assure him he was not at fault (obviously) but they are entirely happy to throw all the blame on the mother while ignoring the actual person who committed the terrible crime. That was a bit annoying. The last author of no Child Left Alone, Barbara Sarnecka, concluded that their findings “should caution those who make and enforce the law to distinguish evidence-based and rational assessments of risk to children from intuitive moral judgments about parents — and to avoid investing the latter with the force of law.” So leaving your children alone in sensible circumstances (not neglect) is now immoral, but should not be made illegal. Phew that was a lot of thought from one lecture. I’m looking forward to more of these. 1 year cancer survival: is your cancer more important than your hospital? 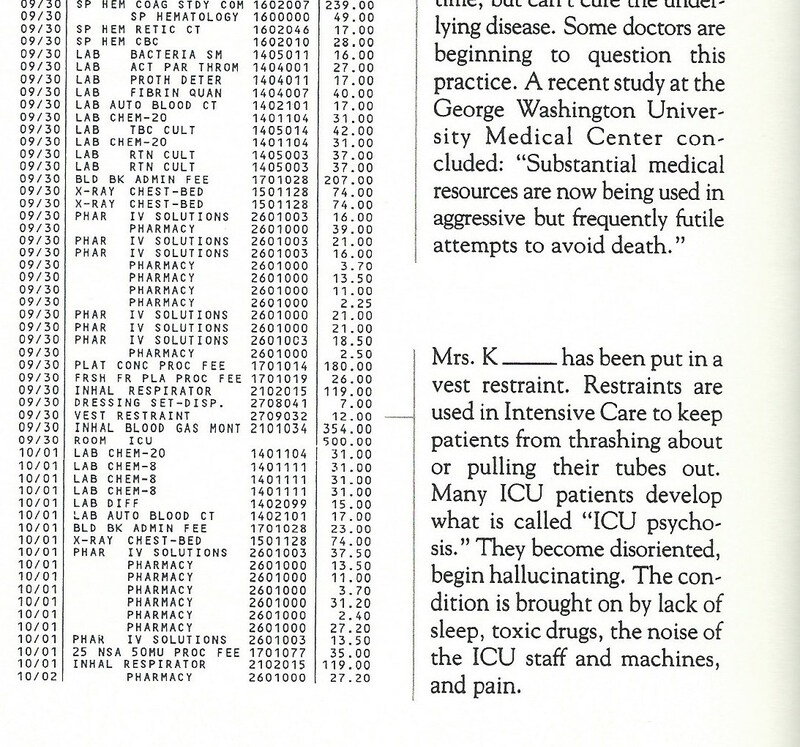 Nowadays quite a few health statistics are published online. Here I’ve got some graphs on some cancer stats published this year. The stats take a while to collect so we are only just onto the 2014 data (in the perfect world hospitals would submit a months stats the next month so the annual data could be published by the end of February. We are not living in that world yet. Also we wouldn’t get sick in the first place in that world, which is why it would be so easy to submit the stats). This set of stats is pretty detailed, it lists the number of patients with each of the ‘big 13’ cancers, at stages 1, 2, 3, 4 or unknown for each CGG (clinical commissioning group) in England. Stage 1 is early and good, stage 4 is late and bad. The 1 year survival for the ‘big three’ (breast, bowel and lung) has also been published for each CCG (the % of patients diagnosed in 2013 who were still alive at the end of 2014). 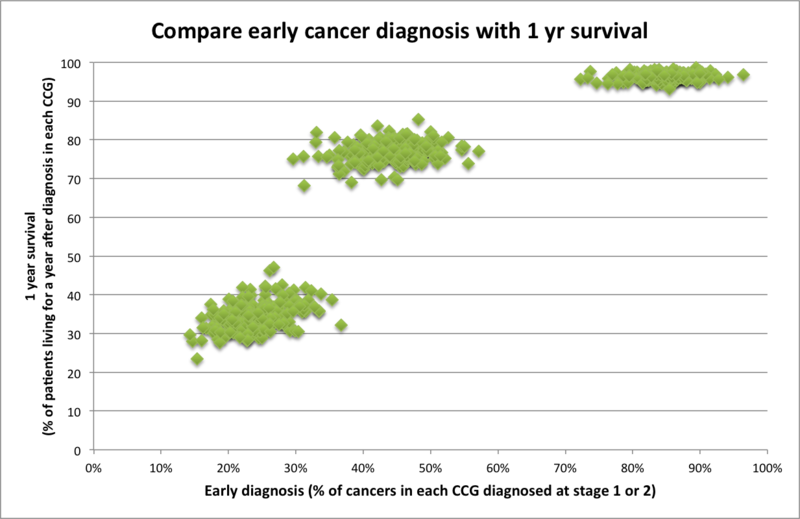 It’s interesting to compare these two dimensions by graphing early stage of diagnosis (by adding up all the patients diagnosed in 2013 and 2014, except three cancers are new with only one year of data) against 1 year survival for each cancer for each CCG. I find it pretty interesting that three such distinct clusters just fall out of the data. In the bottom left is lung cancer. This unfortunately has very bad early diagnosis with only 14-37% of patients diagnosed with stage 1 or 2 and equally bad 1 year survival. Of all the patients diagnosed in 2013 only 24-47% where alive at the end of 2014, depending on where in England they were. Colorectal is intermediate, 30-57% of patients are diagnosed at stage 1 or 2 and 68-85% were still alive at the end of 2014. Breast is best with 72-96% of patients are diagnosed at stage 1 or 2 and 93-97% were still alive at the end of 2014. I think it’s interesting because the variation across the two dimensions for all the CCGs (each dot in each group) is smaller than the variation between the different cancers (the space between the groups). So which cancer you get will affect you more than any variation that exists around the country. Bear in mind that differences between CCGs, might be due to something about diagnosis/treatment OR they might be due something about the population. Deprivation definitely plays a role, for example deprived areas have a much lower screening, which will reduce early diagnosis. So do the graphs show variation in treatment or variation in populations? This isn’t exactly about lifestyle factors. If you smoke a lot, your odds of getting lung cancer are higher, but what determines whether you are diagnosed at stage 1 or 4? What determines how long you have after that diagnosis? While we can’t do a similar graph for any other cancers, as 1 year survival is only published for ‘all’ and ‘the big three’, we can look at early diagnosis for the next ten most common cancers. The same data is shown two ways. The first graph on the left shows the early diagnosis for each cancer lined up by CCG. The second shows each cancer lined up by percentage. Looking at the first graph you can see that there isn’t much of a pattern, a CCG that has early diagnosis in one cancer has late diagnosis of another. Even if you can’t see that by eye, when you measure the correlations the surprising thing is that virtually nothing correlates with anything else. 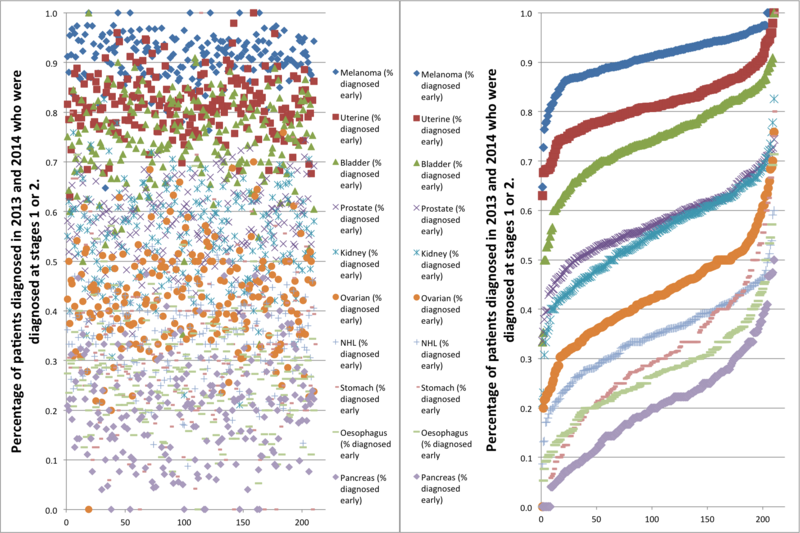 Of all of the 10 cancers shown, early diagnosis in one cancer in one place doesn’t predict early or late diagnosis in any other cancer (there are a few weak, correlations, but we can round that down to ‘nothing’). The next thing, shown more clearly in the second graph where each cancer is lined up in size order, is that while there is quite a range in the percentage of patients diagnosed early each cancer still has it’s own pattern. Melanoma is best then I’ve listed them in early diagnosis order on the graph. Coming up to the end of the blog post, I’d like to close on the answer to all this variation, ideally with a few simple bullet points that would totally fix the problem. But unfortunately I’m all out of simple answers today (get changes in your body checked out? watch out for random bleeding? spend more money on the NHS?) It’s not that I don’t believe in simple answers, I just don’t have one here. Still if I haven’t got any good answers, hopefully it’s at least a good question. Author christinedelonPosted on 12 September 2016 17 December 2017 Categories UncategorizedLeave a comment on 1 year cancer survival: is your cancer more important than your hospital?